1 of 3 In a small bowl, whisk together vinegar, olive oil, mustard, salt and pepper. Set aside. 2 of 3 Heat a nonstick grill pan or skillet over medium-high heat. Coat with nonstick cooking spray; add tofu and grill 3 minutes per side. Remove to a plate and cut into bite-size pieces. 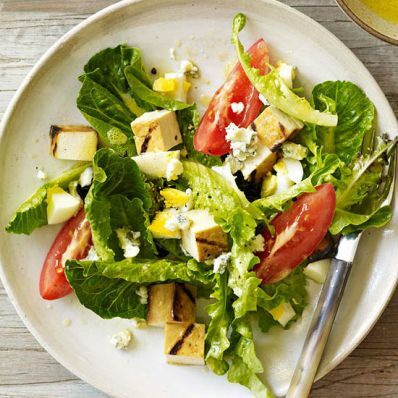 3 of 3 Toss salad greens with 3 tablespoons of the dressing and distribute evenly over 4 dinner plates. Arrange tofu, eggs, blue cheese and tomatoes on top. Serve remaining dressing on the side. Per Serving: 406 mg sodium, 6 g fiber, 4 g sat. fat, 116 mg chol., 17 g Fat, total, 16 g carb., 17 g pro., 279 kcal cal.